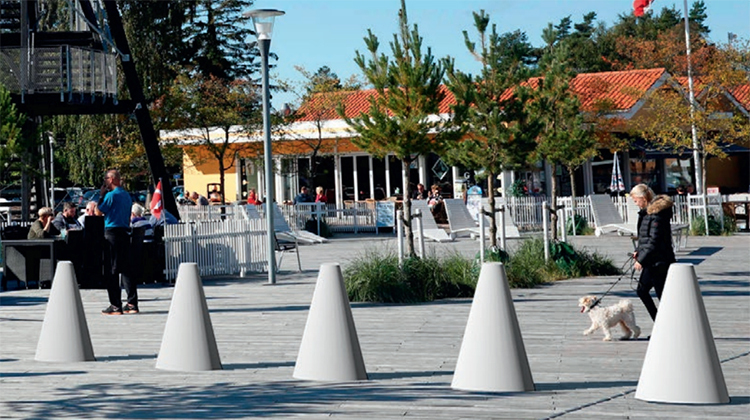 A concrete bollard shaped like an ellipsoid cone CHICANE is suited for positioning in various formations and repetitive patterns to restrict access. If a vehicle runs into it, CHICANE will fall over, but its shape will prevent it from rolling and wedge the bollard under the vehicle. Easy to set up and move around due to the moulded lifting threads on the top and hollows for forklifts at the bottom.